I have never come on board with the Ramesh-Suresh Cadbury 5Star television commercials but the brand channel on Youtube certainly stands out for its fresh idea and execution. 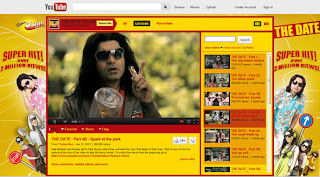 THE DATE FILLUM is a unique 5 part interconnected web video series created by Cadbury using the now-famous television commercial characters, Ramesh & Suresh. The story flow and concept highlights the campaign communication ‘Lost in 5Star’ where the objective is to get the protagonists to meet their first dates. After every 90seconder video, the user can choose from a couple of options that then further the plot and lead to the next story. Total video views have crossed 2.2million and the channel has been around for a couple of months now. The drop-out is around 50% after the first video. A big shout-out to Cadbury who created the video content exclusively for web consumption! This is the kind of video content that will stand-out and work for brands on the web, re-runs of TV content is passé and done to death.